Green Frog Productions presents a major video series about building the Rio Grande Southern. This series will cover building Durango, Ophir, Lizard Head, Rico, Dolores, and The New Mexico Lumber Company at McPhee as well as locations between these towns on a large On3 layout! Also covered will be use of photo mural and hand-painted backdrops, innovations in scenery techniques, laying prototypical track with individual ties, as well as the practical use of pre-fab track, unique construction ideas for structures, massive trestle projects, retaining walls of all types, use of home- made and commercial trees by the thousands, as well as thousands of rock castings, and MUCH more! No matter what scale you model in, this series is for you! Volume 1, Part 1 covers the building of Durango of the 1930's. In this first tape we'll show you how this massive layout begins at Durango. 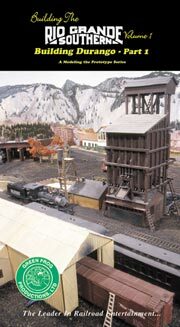 We'll cover benchwork, track laying, scratchbuilding the roundhouse, the car shops, the ash pit and more! By use of archival motion picture film and prototype slides by Mallory Hope Ferrell as well as video and slides of the finished projects, we'll detail the complete building of the yard through Parts 1 and 2, including all the major structures found in Durango of the 1930's.